The rumor mill is already spinning with hints at Killmonger's return in Black Panther 2, with the aesthetics of Madam Slay updated for modern audiences. Black Panther is currently in the running for Best Picture at the Academy Awards, and word is already seeping out about an incredible spoiler that could open the door for Michael B. Jordan to return as the somewhat controversial villain Erik Killmonger. Recently, Angela Bassett aka Queen Ramonda, spoke with Entertainment Tonight about the sequel at the 2019 Screen Actors Guild Awards following her win for Outstanding Performance by a Cast in a Motion Picture for Black Panther. Bassett admitted that she assumed that everybody would be back for the sequel. Black Panther vs Killmonger – Final Battle – Fight Scene – Killmonger Death Scene – T’Challa vs Killmonger – Black Panther (2018) Movie CLIP [1080p 60 FPS HD] #BlackPanther TM & © Disney (2018) Fair use. Copyright Disclaimer Under Section 107 of the Copyright Act 1976, allowance is made for “fair use” for purposes such as criticism, comment, news reporting, teaching, scholarship, and research. As fans recall, Killmonger was mortally wounded in the final combat scene with T’Challa, played brilliantly by Chadwick Boseman. As he bled out from a deep spear wound, Killmonger declined the offer to save his life as they watched the Wakandan sunset. Misunderstood hyperbolic statements aside, many wondered why anyone would turn down the chance to live, even if in a Wakandan prison. But many old school Marvel heads were already onto the possibility of Killmonger being brought back from the dead. Coming back from the dead is a very common trope in comic books. Just days after the film was released last year, people were talking about how Killmonger’s death scene wasn’t really a death scene. And as far as characters that could be integrated into the imaginary African DNA of this Jack Kirby creation, there are several I can think of like Brother Voodoo and Baron Mordo, one of which was alluded to be in Dr. Strange 2 by director Scott Derrickson while the other, played by Chiwetel Ejiofor, played prominently in the first Dr. Strange film. However, there’s a character that only old school heads are truly familiar with but is perfectly suited to be the reason why Killmonger may yet live. 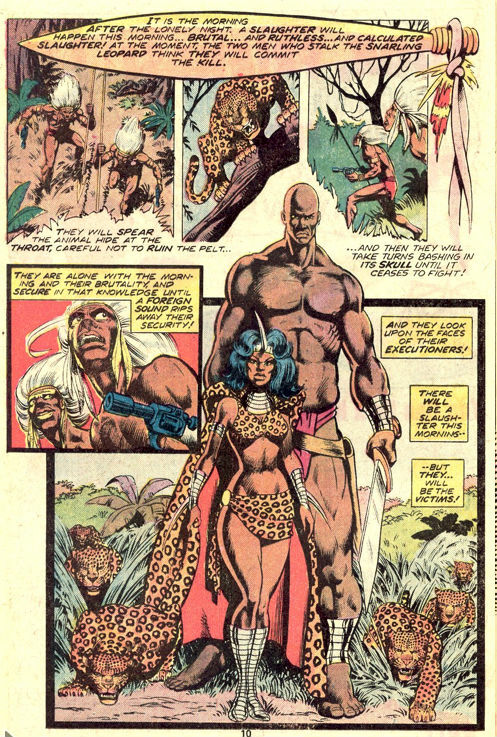 Little is known of Madam Slay’s time before she linked up with Erik Killmonger, which occurred shortly after his first failed attempt to kill Wakanda’s ruling family. She would eventually become his lover. After Killmonger’s first death, which occurred during a failed coup attempt in Jungle Action #17, his body was reclaimed by the Mandarin. With the power of the Mandarin’s Matter Rearranger ring, the power of Slay’s Resurrection Altar was amplified. Months later, Killmonger would awaken. The two would embark on a complicated plan that included kidnapping Jim Rhodes (War Machine) and framing he and Tony Stark for the murder of T’Challa, which fail miserably and resulted in the second death of Erik Killmonger. The aesthetics of Madam Slay updated for modern audiences would indeed be an interesting thing to see play out on the big screen.